The central theme of this short video is…people. Up until now, cities have been ranked on their car parks, skyscrapers and motorways. Now they are being measured by their livability. The rules of the game have changed. Cities that are at the top of the livability stakes are the cities that are full of bicycles. People using bicycles to get about their business. It’s about people and how they interact. Thats why bicycles are so wonderful. They amplify the ability to engage with the city, its people and surroundings. It’s people that bring vibrancy and life to a city. This video is also designed to highlight how easy it is to ride a bicycle. No special equipment or knowledge is required. Cycling can be an everyday activity. It already is an everyday activity in an increasing number of cities around the world. Using a bicycle makes sense for short utility type trips. It’s as easy as walking, but faster. There are many potential ‪#‎wheeledpedestrians‬ amongst us. That is the growth market. But to get those people riding bicycles everyday like wheeled pedestrians is going to require some smart and strategic interventions. A wheeled pedestrian has as much interest in discussing the details of a cycle path as the average motorist has in discussing the details of traffic signals. Of course, the transport environment (separated cycle paths, speed reduction) needs to be vastly improved before those potential #wheeledpedestrians will seriously consider this option. But equally importantly, the image of cycling needs a major overhaul. The overriding public perception of cycling at present is about sports and recreation. Focussing on encouraging those cyclists to convert to everyday cycling will have limited long term success. Instead of talking about ‘cycling’, we need to be talking in terms of ‘riding a bicycle’. Riding a bicycle needs to be presented as a normal everyday activity. Convincing the people who are not currently using a bicycle requires the use of different strategies. At present, advocacy seems to be all based around the provision of cycle infrastructure. That’s an inherently limiting strategy. There are a wide range of strategies and approaches that need to be employed. 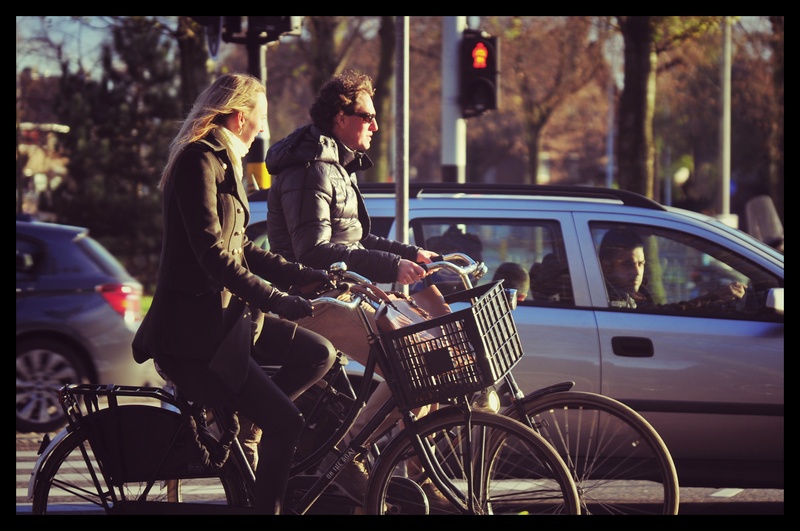 A wheeled pedestrian has as much interest in discussing the operation of a cycle path as the average motorist has in discussing the operation of traffic signals. Presenting cycling as a normal everyday activity is much harder than you would imagine. Being a teacher and watching cycling being ‘taught’ in a school environment, I speak with some authority on this matter. Isn’t it odd that while we have professionals building cycling infrastructure for us we don’t have any professionals doing the marketing stuff. So in the meanwhile, the Ninja Princess and I will continue to produce these sub-par videos, but if you know any professionals that would be in to making cool videos to promote bicycles in the city, please get in touch. I know my limitations. “Frankly, we’ve got better things to do than compare bulges”. I love seeing visual imagery being used to promote cycling, as a way of reaching out to a wider audience. It’s what the motor industry does so well. And even though all this imagery is quite fake and contrived, it doesn’t matter. It works. It’s all about connecting at an emotional level. Growing customers. Growing a support base. Growing a mandate. It’s time to take cycling back. To reclaim it from the enthusiasts. To make it fun again. Of course, the motor industry does not only have expertise at marketing. It is deeply involved in transport policy and all the other technical stuff. It’s very active in maintaining the status quo, the dominance of motor vehicles in our lives and in our cities. And all the stuff is done in back rooms by well paid technical experts supported by government ministers with a clear agenda. (Although their methods are increasingly coming under scrutiny). It’s a billion dollar industry. There is a lot at stake. And the industry is not going to cede territory willingly. But while promoting cycling by making it look fun and attractive is to be encouraged, making falsely ‘positive’ statements (let’s give it a name – boosterism) about the current state of cycling ridership is unhelpful, at best. Cycling has a long way to go before it moves beyond its current ‘margin of error’ status. The good thing going for cycling is its inherently attractive qualities. And thanks to the internet, we have examples of how it works so successfully in other cities around the world. But what’s working against it, is the massive status quo machine. That knowledge should be enough to wake us from our slumber and get us started on developing strategies and messaging that challenge this status quo. Should be. I won’t hold my breath. The killing roads: why our car culture is not sustainable. Suburban residents awoke to this scene. 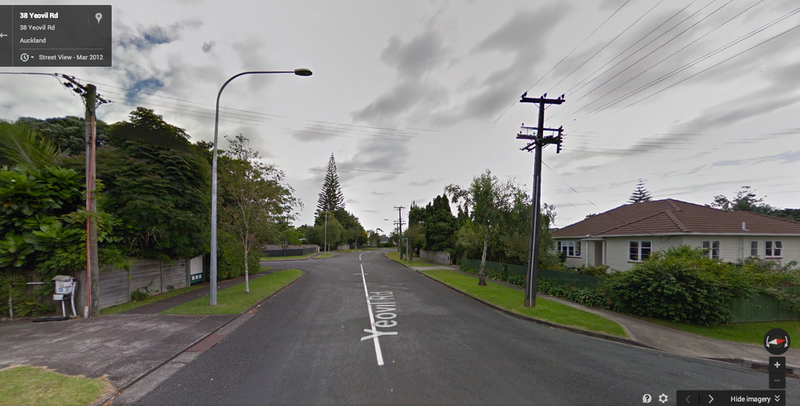 A 14-year-old boy died when a car he was in crashed into a power pole on Te Atatu Peninsula. He died at the scene. 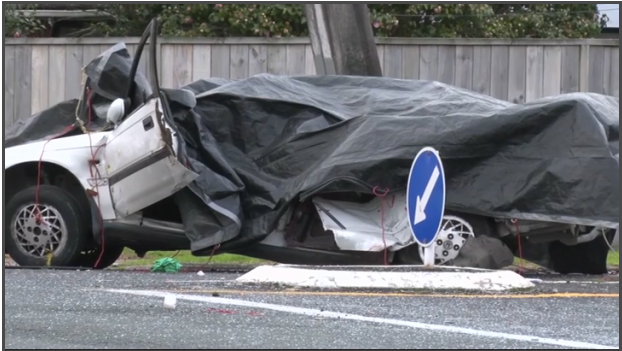 The driver and front-seat passenger, both 16-years old, suffered moderate injuries and were taken to Auckland Hospital. Police said early indications were that speed was a factor. Enquiries were underway to determine whether alcohol was also involved, Sergeant Shaun Palmer of Waitakere police said. “We now have a family who are devastated, they’ve received news this morning that will change their lives forever, and we have a community that is grieving. And what’s even more tragic about this event is that it hasn’t prompted a widespread call to address the consequences of our deadly car-culture. It’s going to be impossible to create a civilised, cyclised, people-focussed city until we take this ugly car culture seriously. Cars are dangerous. They are a health hazard. They are like tobacco. Enough is enough. For everyone’s sake. This culture is not sustainable. I fear that the crew at Bike Te Atatu are going to struggle to convince significant numbers of parents and their children to ditch the car in favour of walking and cycling. That’s for the simple reason that cars project an envelope of danger. Just the thought or the sound of a speeding car is enough to put parents off letting their children ride to school independently. Children don’t need to be taught how to ride a bicycle or how to wear a helmet. Experience tells me that that’s the easy part. But they do need to be protected from the danger of speeding cars. That’s where we, the adults, come in. Scene of the crash: all that space devoted to moving cars. I would suggest that, in suburban environments like Te Atatu, addressing issues of speed need to take place before the introduction of cycle infrastructure. Or at least they need to happen in tandem. Because regardless of the quality of a cycle lane, it is the element of subjective safety that will determine whether individual members of the public will feel safe to use the infrastructure. That’s why the ‘build it and they will come’ approach needs to be taken at face value. Any quality infrastructure needs to be matched with a high provision of subjective safety. A significant reduction in speed will go someway to addressing that. Smoking used to be socially acceptable. Thankfully, that’s changed. But it didn’t change by accident. The way we view cars and the unsustainable culture that has developed over the decades also needs to change. That can start with strong community leadership, to gain support amongst the local community and in turn, put pressure on the local transport authorities and relevant agencies, to take this issue seriously. After all, it’s an issue critical to all citizens, not just cyclists. Our cities don’t need more cyclists, they need more wheeled pedestrians. My work colleagues regale me occasionally with their encounters with cyclists. These unsolicited monologues all tend to have a ‘please explain’ overtone. I guess I’m viewed as a suitable target because I am one of ‘them’. It’s easy for motorists to lump us all together and believe we all exhibit the same bad behaviours. It’s easy to do so because cycling is such a rare commodity. Similarly, members of the public ‘advise’ me regularly to wear a helmet when they see me riding slowly through the park on my bicycle. My hope is that these same people are also reminding motorists to stop using a cell phone while driving. It’s an important distinction because one of those activities has the potential to do some serious harm. The responses that my colleagues tend to prefer are ones of contrition; apologies on behalf of the cycling fraternity. Occasionally I try my luck with a response that presents a bigger picture – that there are a growing number of cities around the world where priority is given to the moving people over the moving of cars. In those cities, motorists are not at the top of the food chain. In fact, it’s quite the opposite. Pedestrians, people on bicycles, people on public transport – in that order, are all prioritised over motorists. The sums have been done. The research shows clearly that getting people out of cars and into active modes of transport is a win-win situation. It makes for a healthier and wealthier community and economy. That is what we need to be aspiring to. Cities with high numbers of people cycling will have a lot of what I like to refer to as, ‘wheeled pedestrian’ cyclists. That is, people riding bicycles that emphasise comfort and utility, over speed. The bicycles feature things like mudguards, chain guards and facilities for carrying things (including children). They are perfect for doing short, local trips. Lycra, helmets and other specialised equipment are the preserve of sports cyclists. Park and Ride facilities around public transport hubs cater for bicycles, not cars. These cities are also endowed with a network of wide and separated cycle paths. These paths are great because they make cycling safer and more appealing to a larger group of people. Motorists also benefit because they gain from the increased level of predictability. Cyclists are allocated a space for cycling. Motorists know to expect cyclists and know where they will be. It’s the stuff that would make my work colleagues happy. But there’s more to it. The approach to road design by the transport authorities in cities with high rates of wheeled pedestrian cycling is completely different. Instead of being focused on funnelling as many motor vehicles through the city as quickly as possible, cities that have high rates of everyday cycling focus on what is called ‘sustainable safety’. The purpose of sustainable safety is to take the ‘sh*t happens’, out of road travel. Speed reduction and street design that caters for human error feature highly in these cities. Getting people out of cars doesn’t just happen automatically. It requires well planned and strategic input. Viable transport alternatives to the car need to be provided of course but efforts in making the bicycle a cool and appealing form of transport also need to be undertaken. (I always marvel at how the tobacco industry managed to make a deadly habit into a socially acceptable practice). Our civic leaders need to take the lead in developing a strong social contract that puts the safety of all road users as the top priority. Driving needs to be viewed as a public health issue in the same way that tobacco has become. It will take time so it needs to start sooner than later. It is my days spent in a classroom with a bunch of exuberant 5 year olds that tells me that change is possible. These children are naturally inclined to be kind and caring to one another. They want to work together towards a common goal even though they are all unique individuals. My job is simply to let that culture come to the fore. I do the foundation work, establishing a supportive environment and providing positive models. It’s hard to find the words to describe the magic that unfolds. The success I experience in my classroom tells me that a significant improvement in our transport culture could be achieved as well. If we set our minds and hearts to it. New cycle path, missed opportunity. 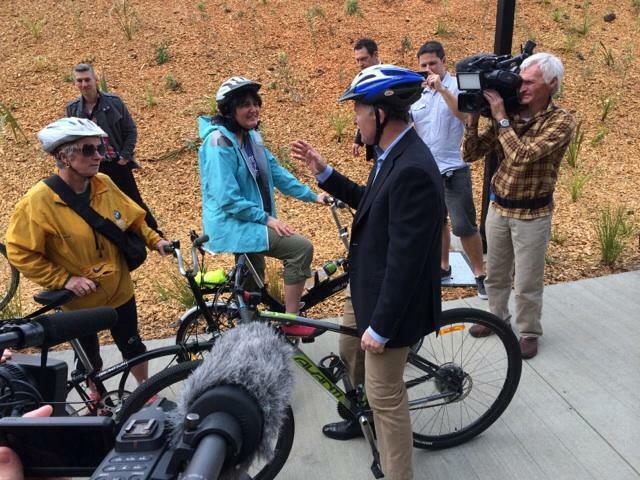 John Key prepares to ride the Grafton Gully cycle path. Image via Auckland Transport. Congratulations Auckland. You are now the proud owners of a brand new, high quality, dedicated cycle path. The new ‘Grafton Gully’ path connects the CBD to the North Western cycle path. It runs parallel to one of Auckland’s motorway corridors so you will be safe from those speeding cars, at least while you are on the path. Anything that gets more people cycling or helps those people already doing it to continue cycling, has got to be a good thing. The path, of course, has it’s limits. The main one being that it runs beside the motorway. It has no street frontage; the places that people want to go. Shopping, dining and stuff. One day, I would also hope that Aucklanders can organise themselves into an advocacy group that operates at a distance from the organisation that builds motorways for us. The argument for building a cyclised city is surely more compelling than having to rely on a motorway being built through your neighbourhood. Will the building of cycle paths all come to a sudden end when the last motorway is built? Pejorative suggestion?, but still…it’s hard to criticise a government’s motorway obsession if a cycle path is thrown in to sweeten the deal. Is it a fair price for being unable to speak directly and critically? When I saw the photo of John Key riding a bicycle on the newly opened path, I also concluded that this was a missed opportunity. Celebrating the opening of a cycling path and promoting cycling as something that all New Zealanders should and could be doing, are not the same thing. Making cycling look normal is critical and far from a trivial matter. Here was a chance to direct the conversation. The cameras and eye balls of the nation were momentarily trained on cycling. A misunderstood concept for most. It’s a serious task…ensuring that the PM and all New Zealanders can describe in unequivocal terms what the ingredients of a cyclised city are. This was an opportunity to front foot the story for the non-cycling public. This was an opportunity to preempt the questions and doubts about the role of cycling in the city. The stakes are too high for anything to be left to chance. Look to the car, sugar and tobacco industry for ideas and inspiration. Cycling has so many good things going for it, but on its own that is not enough. It needs a really serious nudge. And it’s not as though our PM hasn’t enjoyed the wheeled pedestrian experience before.